Nothing speaks comfort than a bowl of hot soup and freshly baked bread (and butter). Even though here in Singapore, it is warm all year round, there are days where the rain comes and giving us that bit of “winter feel”. I have been a fan of Smitten Kitchen for quite a while. I love how Deb just rustled up and made everything she created so effortless and gorgeous, and in between she was more than happy to share some of her missteps. 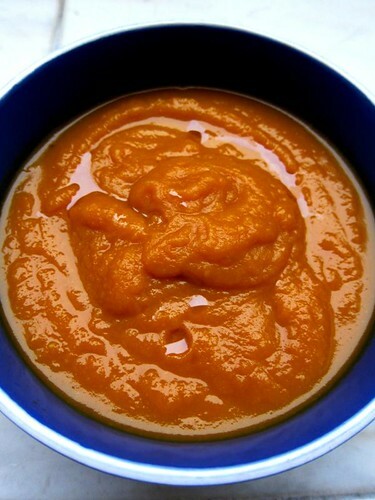 The thing I love about Deb’s carrot soup was it has a bit of Asian twist to it – miso and sesame oil were used – and guess who just bought some tip top 3-years fermentated miso (from Isetan)? Though it took about an hour for the soup to be done, the finished product was just incredible. The soup was rich and savoury, and what’s amazing was that there was no cream added. As the miso I bought was really salty, I cut down the portion. In addition, I also poured in more vegetable broth as I found the soup to be too thick and almost like puree (aka baby food). Still I have to say, the drizzle of sesame seed oil was a surprise factor – and the soup needed that. When you have soup, you got to have bread. When I ain’t going to wait 3 hours for my bread to proof and bake. So I opted for an easier way – soda bread. Soda bread is a quick bread that made use of a rising agent (baking powder or baking soda) and buttermilk to help give the bread the rise. And the Fabulous Baker Brothers’ version is fast and any 4 year-old can make it. All you need is four ingredients – spelt flour, sea salt, baking powder and buttermilk. Spelt is a type of whole wheat flour that is highly nutritious and very suitable for soda bread as the gluten in spelt breaks down fairly easily. However spelt has very little fibre. So to boost the fibre level, I substituted half the portion of spelt flour with whole wheat flour. 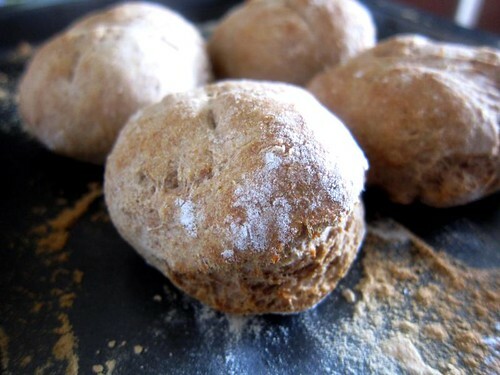 The soda bread was every bit delicious and quick – it took me less than 20 minutes to get the bread roll done. Once they were out from the oven, rest for 1-2 minutes, break bread and spread some butter, they were good to roll with the soup. Happy camper! - Preheat the oven to 230oC. - Add buttermilk and using a metal spoon, mix all the ingredients together for about 2 minutes – do not over mix or over knead the dough – this is one bread dough that required very little work. During mixing, check and make sure there are no dry bits at the bottom (I added the buttermilk bit by bit to ensure I do not end up with a super wet dough). - The moment all the ingredients have mixed together and you have a sticky dough, flour your work surface (I used my wooden chopping board) and tip the dough onto it by using your scraper. - Cup the dough between your floury hand, shape it into a round place directly onto the baking stone (I don’t have a baking stone, so I placed my baking tray in the oven to get it warm up). 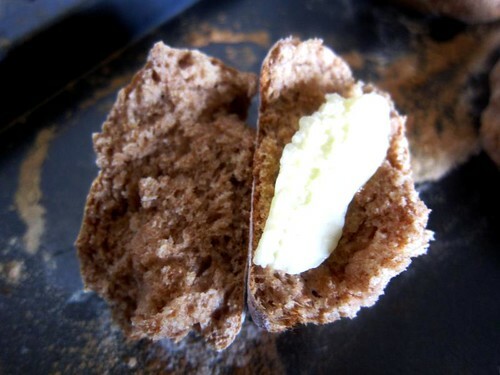 - Using your scraper, cut a cross deeply into the dough and bake for 15-20 minutes until your soda bread has a golden crust and sound hollow when tapped on the bottom. 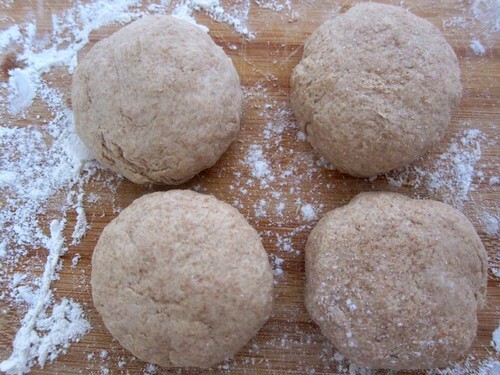 - You can also use the same recipe to make dinner rolls. Weight the finished dough (it should be around 320g), divide them equally into 8 rolls, shaped to a round and cut a cross on each roll. Place them on a baking tray with space in between, and baked for 8-10 minutes.